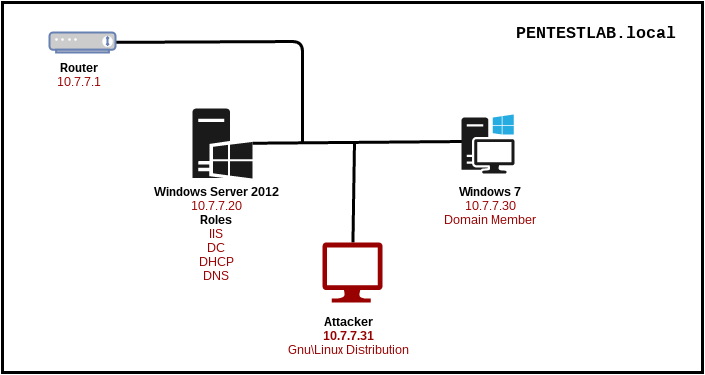 In internal penetration tests, we simulate attacks that can be performed against on misconfigured services and protocols on network-level.These attacks are mostly caused by the fact that mechanisms such as Address Resolution Protocol (ARP), Dynamic Host Configuration Protocol (DHCP), and Domain Name System (DNS) are not configured properly.One of the most important attacks that can be encountered is undoubtedly Man-in-the-Middle. It allows access to sensitive information by listening to network traffic or manipulating the target to be accessed. Security measures against this attack can be taken on network equipment such as routers and switches. 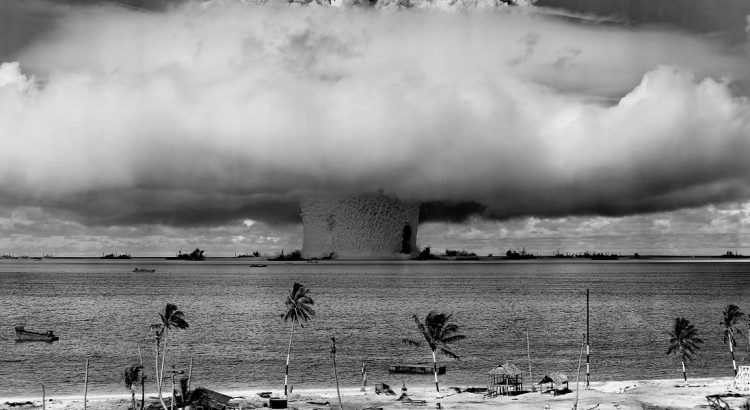 However, due to the inherent weaknesses of some protocols, we can perform the same attack with different methods. For this reason, the main theme of this article will be Man-in-the-Middle attacks against LLMNR, NetBIOS and WPAD mechanisms. Before begin, I would like to explain how the computers have Windows operating system communicate with each other in the same network and perform name resolution. In its configuration files, inquires about the system information that it wants to reach. At the same time, it checks whether the device to accessed is itself. First of all cache is checked. If the information for the device to be accessed is exists in the cache, this information is used. The DNS cache can be learned with the ipconfig /displaydns command. If the computer does not find any information from the configuration files about the device that it wants to access, it sends a query to the DNS server on the local network. LLMNR is a protocol that is processed when the DNS server fails in name resolution. It works in the “Session” layer of OSI Model. NetBIOS is an API, not a protocol, used communicate between Windows operating systems. The NetBIOS name of the computer is the same as the computer name. What is LLMNR and NetBIOS-NS? LLMNR (Link Local Multicast Name Resolution) and NetBIOS-NS (Name Service) are two components that Windows operating systems use for name resolution and communication. LLMNR has been used for the first time with Windows Vista operating system and is seen as the continuation of NetBIOS-NS service. In cases where the DNS server fails in name resolution queries, these two services are continued to name resolution. The LLMNR and NetBIOS-NS services attempt to resolve queries that the DNS server can not answer. In fact, this is the form of cooperation between Windows operating system computers. The LLMNR protocol is served by the link-scope multicast IP address 224.0.0.252 for IPv4 and from FF02:0:0:0:0:0:1:3 for IPv6. It performs own operations via 5355 TCP/UDP port. For example, while trying to ping to test.local that is not on the network, the first query goes to the DNS server. If the DNS server can not resolve this domain name, the query will be redirected to the LLMNR protocol. LLMNR is not an alternative to the DNS protocol; It is an improved solution for situations where DNS queries fail. It is supported by all operating systems marketed after Windows Vista. NetBIOS is an API that the systems in the local network use to communicate with each other. There are three different NetBIOS services. Name Service, it uses UDP 137 port for use for name registration and name resolution. 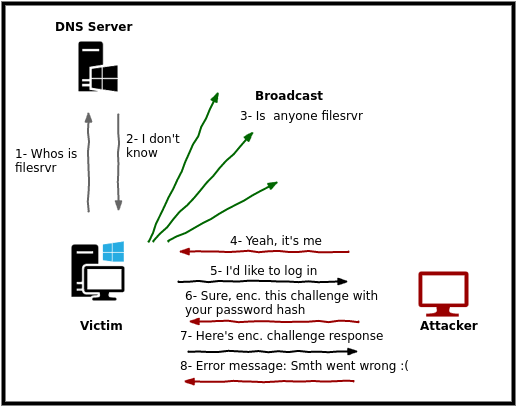 Datagram Distribution Service, it uses UDP 138 port for connectionless communication. Session Service, It performs operations on the TCP 139 port for connection-oriented communication. The LLMNR protocol is used after the unsuccessful DNS query because the name resolution will be applied with the sort I share at the beginning of the article. 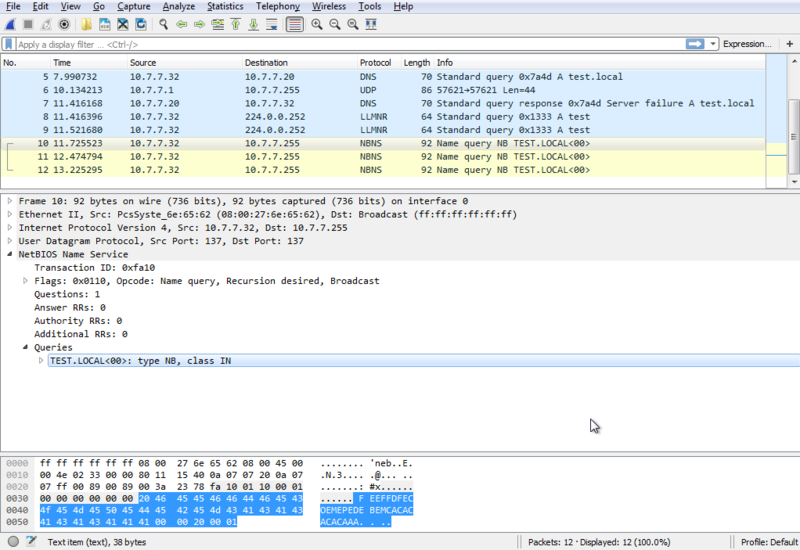 And then a NetBIOS-NS packet, which is a broadcast query, is included in the traffic. Theoretically, these seemingly innocuous and functional systems have no protection against Man-in-the-Middle attacks on the local network. An attacker can obtain sensitive data such as username and password hash with successful attacks. The victim will try to connect to the file sharing system, named filesrvr, which he typed incorrectly. The name resolution, which will be performed with the steps we mentioned earlier, will be questioned on the victim’s computer first. In step 2, because of the DNS Server does not have a corresponding record, the name of the system is sent as LLMNR, NetBIOS-NS query. 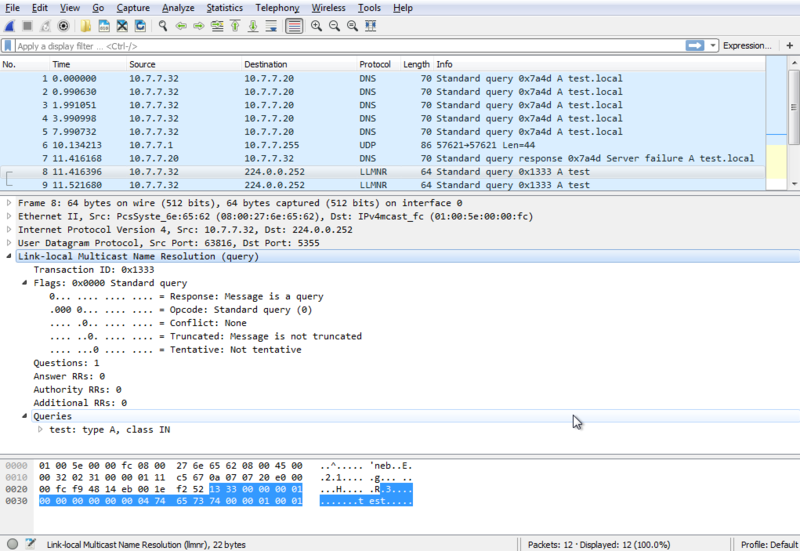 The attacker will listen to the broadcast and respond to all LLMNR and NetBIOS-NS queries. In this way, it is possible to manipulate traffic with a fake session and obtain username and password hashes. There are different tools to do this attack. We start listening to the network traffic by specifying which network interface will be listened by the responder. And we are getting SMB-NTLMv2 Hash! LLMNR poisoned answer sent to this IP: 10.7.7.30. The requested name was : filesrvr. As we know NTLMv2 hashes can not be used directly for attacks Pass the Hash attack. Thus we need to perform password cracking attack in order to get plain-text password from out of captured hash. There are several tools for hash cracking; John the Ripper, Hashcat, Cain&Abel, Hydra etc. We will use hashcat to crack the NTLMv2 hash that we got from Responder. The Responder tool keeps the hash values it detects under the /usr/share/responder directory. Hashcat is an open-source password cracking tool. Besides, it has GPU support. It can detect the hash pattern with the -m parameter. At the end of the command, it will start a brute force attack by using dictionary. And voila! We get password which is Abcde12345. Organisations allow employees to access the internets through proxy servers to increase performance, ensure security and track traffic.Users who connected to the corporate network need to know proxy server for specific URL without doing configuration. The Web Proxy Auto-Discovery Protocol (WPAD) is a method used by clients to locate the URL of a configuration file using DHCP and/or DNS discovery methods. Once detection and download of the configuration file is complete, it can be executed to determine the proxy for a specified URL. According to the above sequence, DHCP poisoning attack can be done for the first step. DNS poisoning attack can naturally be performed for the second step. But as I pointed out at the beginning of this article, configured network devices prevent these attacks. When a query is made through the LLMNR, this request will go to every client in the network via broadcast. At this point the attacker sends his wpad.dat file to the clients, acting like a wpad server. The important thing is that WPAD protocol is built in Windows operating systems. This configuration can be seen in the LAN Settings Section of the Internet Explorer browser. With this configuration, Internet Explorer makes a WPAD name resolution query on the whole network. Responder is a great utility for MiTM attack. Responder serves a fake WPAD Server and responds to clients’ WPAD name resolution. The client then requests the wpad.dat file from this fake WPAD Server. Responder creates an authentication screen and asks clients to enter the username and password they use in the domain. Naturally, employees write usernames and passwords used in the domain name. Finally, we can see their username and passwords. Using Responder tool is really simple. remote: Counting objects: 886, done. Receiving objects: 100% (886/886), 543.75 KiB | 255.00 KiB/s, done. Resolving deltas: 100% (577/577), done. I set up the following systems in order to simulate this attack. Now, we serve the fake HTTP Server and wait for clear-text passwords. 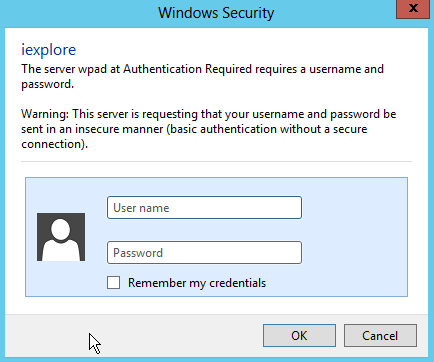 And our victim will see the following dialog box and naturally type the username and password. [HTTP] Basic Password : secr3tPassw0rd123! The responder is not only MiTM attack for the WPAD service. It can force victims to downloadinga malicious files by directing ze to a fake web page. Social engineering can be used to realistically prepare the web page to be used for this attack. However, the Responder itself has a fake redirect page as well. All we need to do is make a few changes to the responder.conf file. 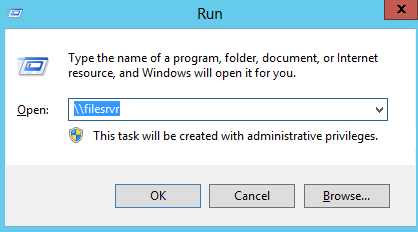 We set “Serve-HTML” and “Serve-EXE” parameters to “On”. And we’re starting to run the Responder again. Now, when the victim tries to go out to the internet, ze will only see the following page. And by chance, the victim clicks on the Proxy Client connection and Bind downloads the CMD Shell, so we can connect to the victim’s 140 connection point with netcat. First solution for this attack is, create DNS entry with “WPAD” that points to the corporate proxy server. So the attacker won’t be able to manipulate the traffic. 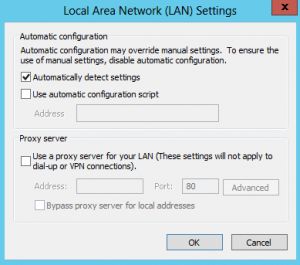 Second solution is disable “Autodetect Proxy Settings” on all Internet Explorers with Group Policy.